Allow the Magento store admins to auto-approve Magento reviews. Want to auto approve reviews submitted by the users? Thanks to our auto approve reviews Magento 2 extension that solves your problem. Our Magento 2 auto approve review extension allow the admin to auto approve Magento reviews. This is premium feature provides flexibility to the admin while handling the review approvals. Not only this, but the Magento product review extension also displays custom messages upon submission of the review. 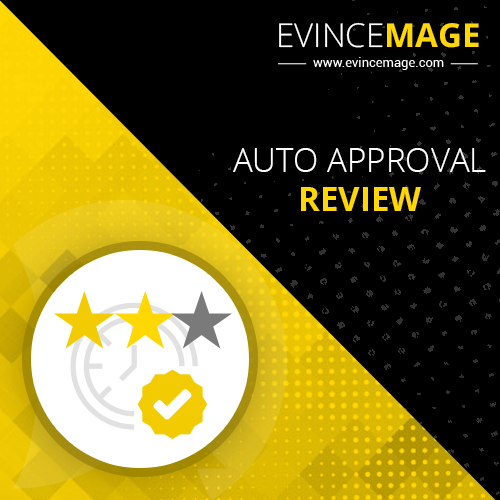 The Magento 2 auto approve review extension facilitates the admin to auto approve advanced feedback reviews as and when submitted by the users. The admin need not approve Magento reviews and ratings. Our extension takes care of that. The admin just needs to “Enable” the module/extension along a couple of selections. That’s all. You are good to go. Once the admin has enabled Magento 2 auto approve review extension, the admin just needs to select the customer group whose reviews he wants to auto approve. In this, the admin can even select multiple customer groups to enable multiple customer groups whose customer product review are to be auto-approved. Even after successful submission of advanced review by the customer, the Magento 2 auto approve review extension allows the admin to craft personalized confirmation messages which will be after the customer submits the review. The admin can easily install and configure Magento 2 order tracking extension. The admin just needs to “Enable” the extension form the “Configuration” section of stores. This is all to configure the extension. Our Magento 2 auto approve review extension holds the capability to configure multiple stores with a single installation. In this, our extension allows admin to handle multiple stores with a varying configuration to in a single install.